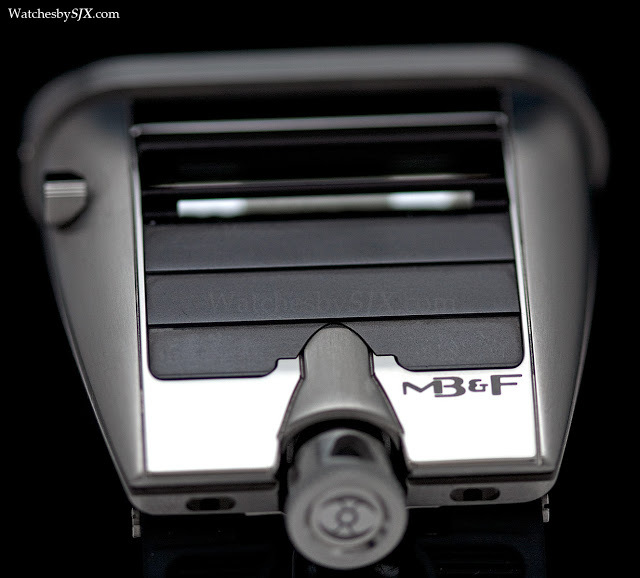 MB&F has just unveiled its latest horological machine: inspired by sports cars of the seventies and the brand’s new entry level machine, the Horological Machine No. 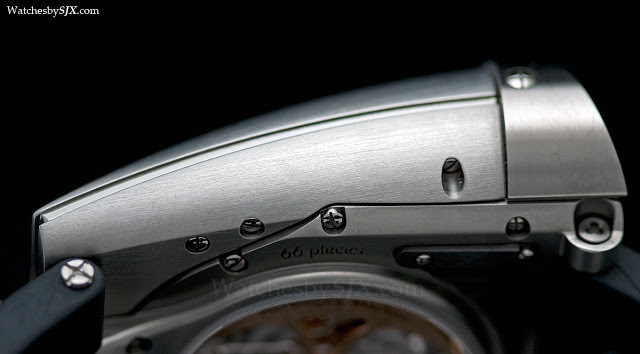 5, in zirconium. 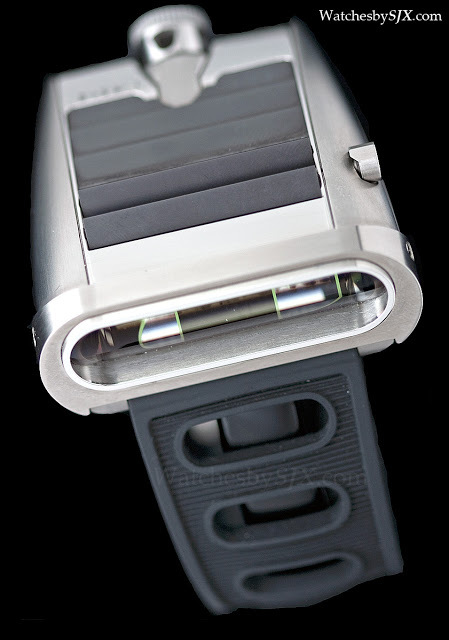 Being a child of the seventies, Maximilian Büsser’s fifth Horological Machine takes inspiration from two objects from the seventies – sports cars like the Lamborghini Miura and the Amida Digitrend. 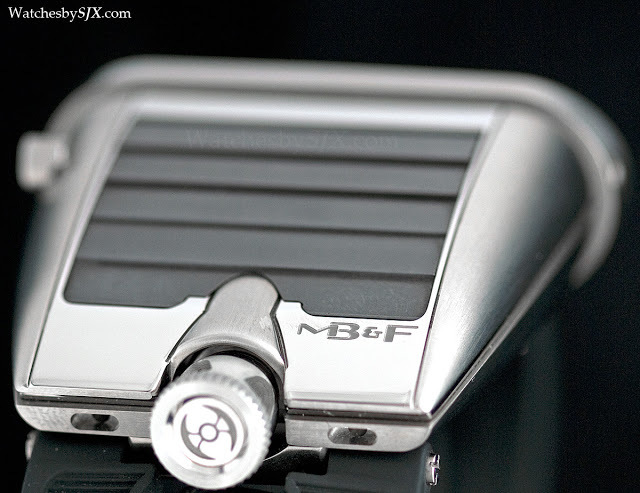 The MB&F HM5 is many things: a driver’s watch, a jump hour, a sports watch. 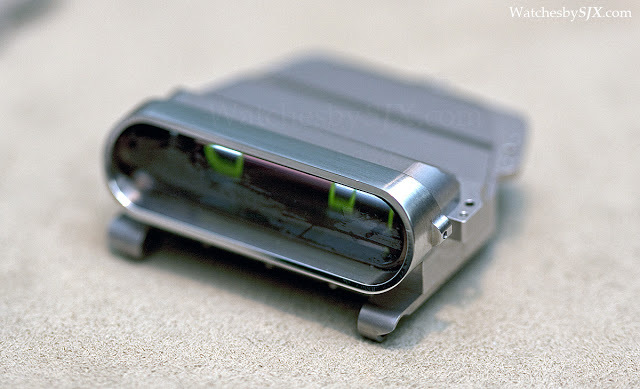 But above all the HM5 is a tribute to the automobile. 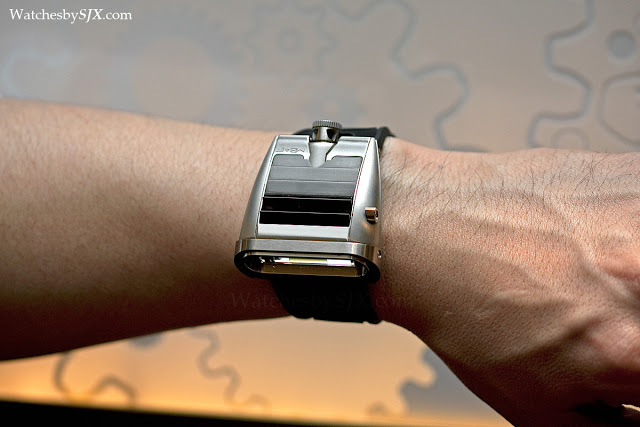 However, rather than having a steering wheel rotor and brake caliper pushers like all other car-themed watches, HM5 has been cleverly conceived in its entirety as an automotive watch. 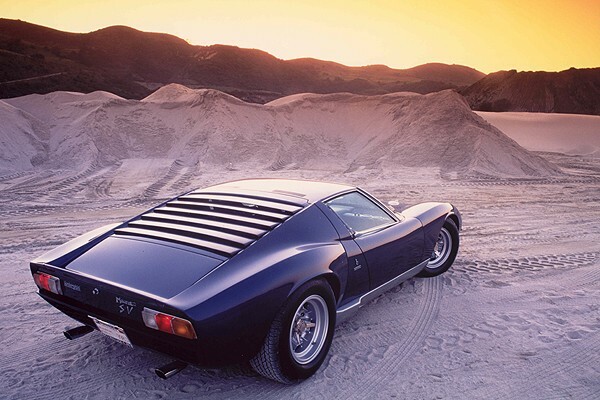 From the back the HM5 resembles the sloped, vented rear of a Miura and other seventies sports cars. 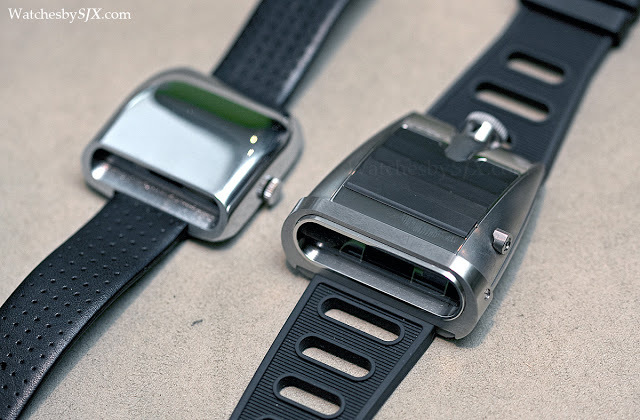 Of all the Machines I think the HM5 might be the one with the greatest longevity in terms of design. 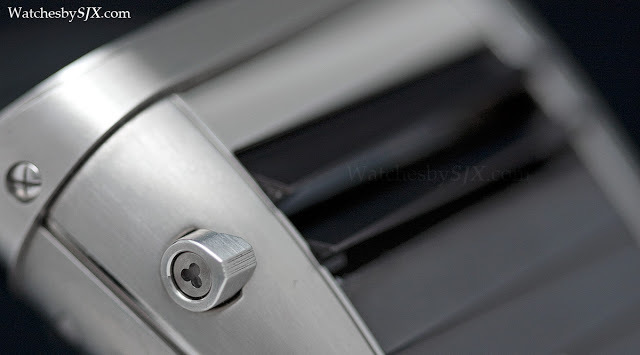 Compared to the other Machines, it is trying less hard to be different. 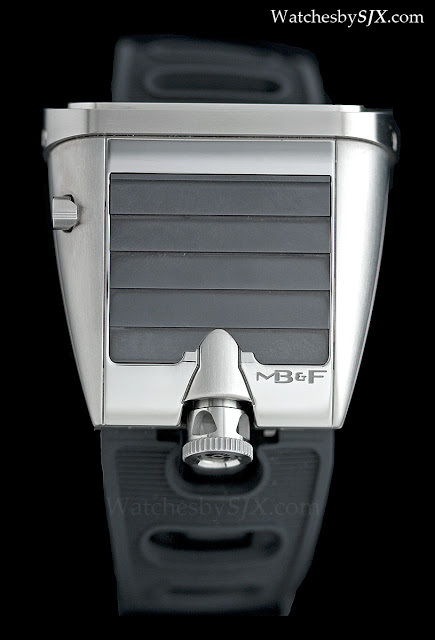 The MB&F HM5 is driver’s watch with jumping hour, which can be adjusted forwards and back. 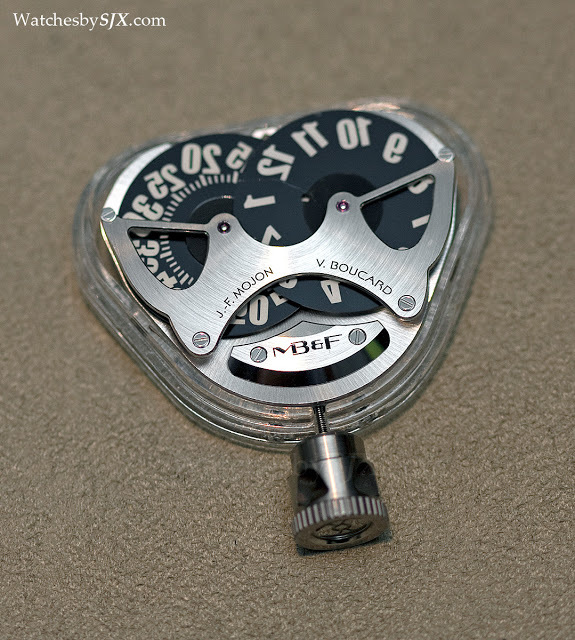 Developed by Jean-Francois Mojon and Vincent Boucard of Chronode, the movement has two oversized and overlapping discs for maximum readability. It is built on the Girard-Perragaux cal. 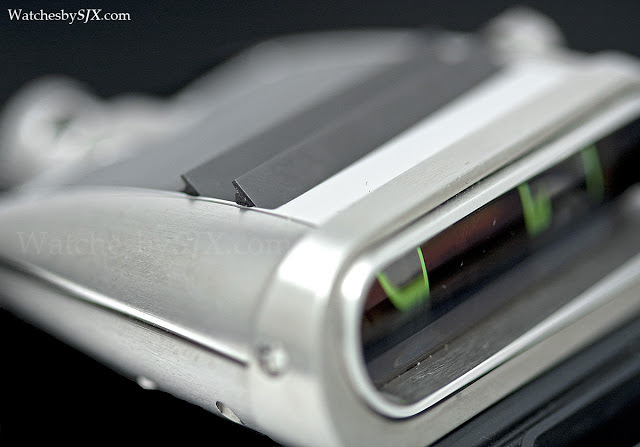 3100, as with most of the Machines. But as with all Machines, it is the case that is most unusual. 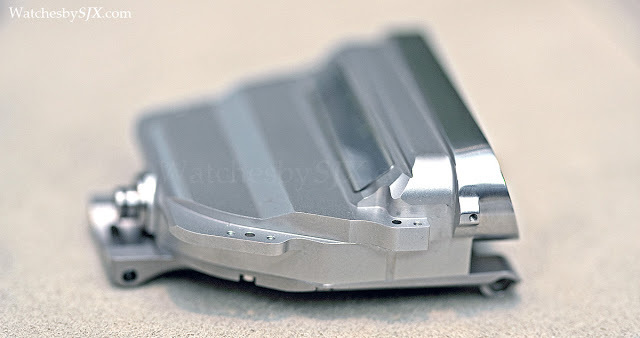 First, the case construction is like that of an automobile. 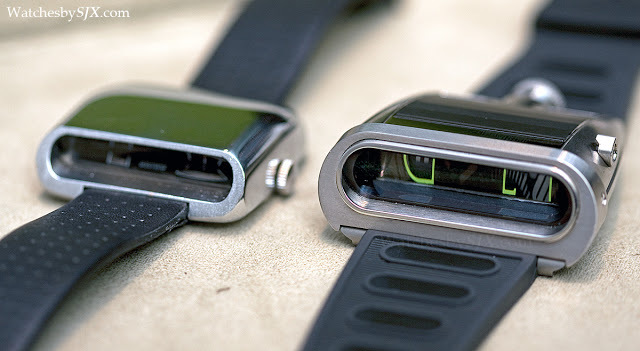 The water-resistant chassis contains the movement and crystal, and onto that the zirconium bodywork is screwed on. 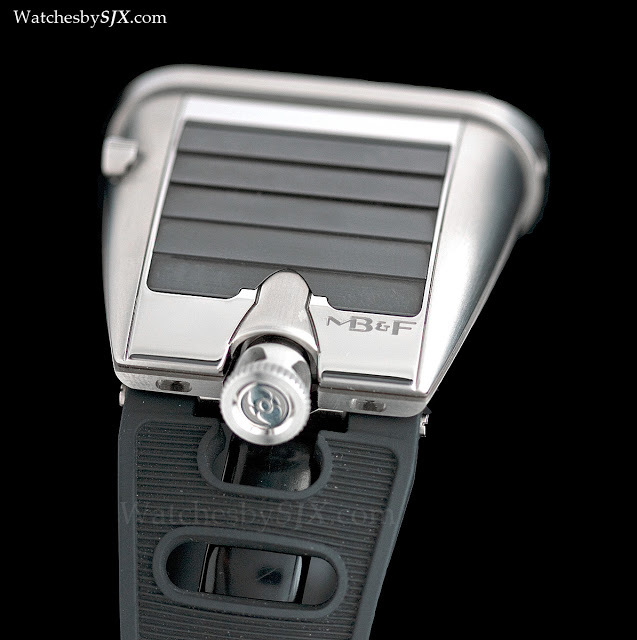 Because it’s water-resistant, this watch is supplied with a rubber strap, a first for MB&F. 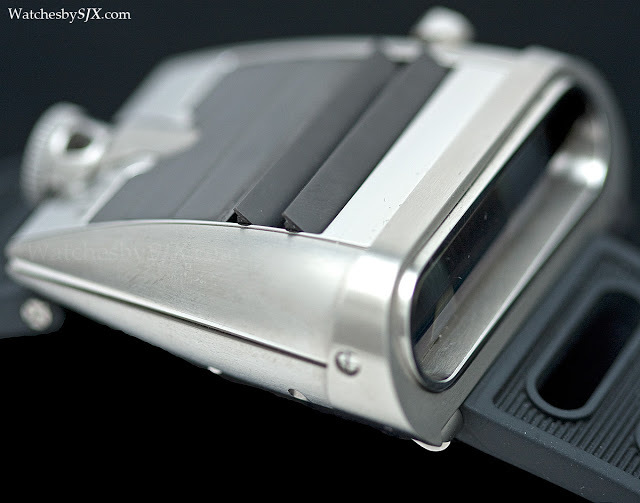 From the side the zirconium case of the HM5 is strongly reminiscent of the MB&F HM4 Thunderbolt, which was its immediate predecessor in the HM series. 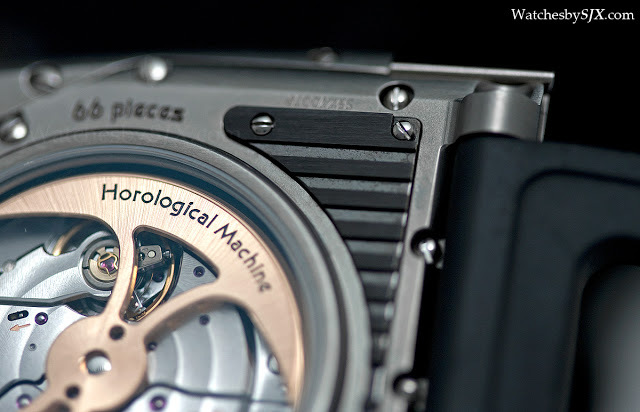 On the two of the watch are a pair of louvres which can be opened by a small lever on the case. 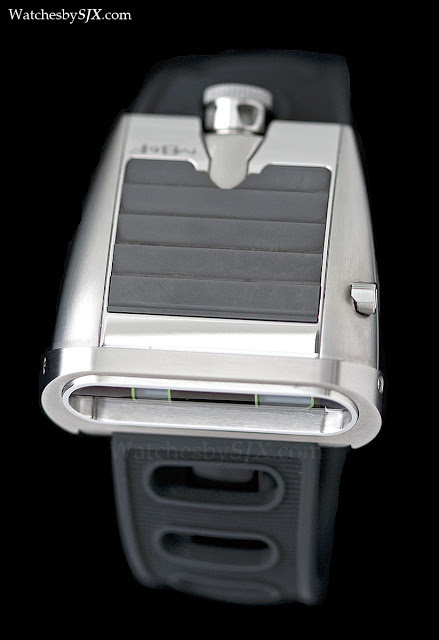 These allow sunlight into the case, which charges up the Super Luminova. 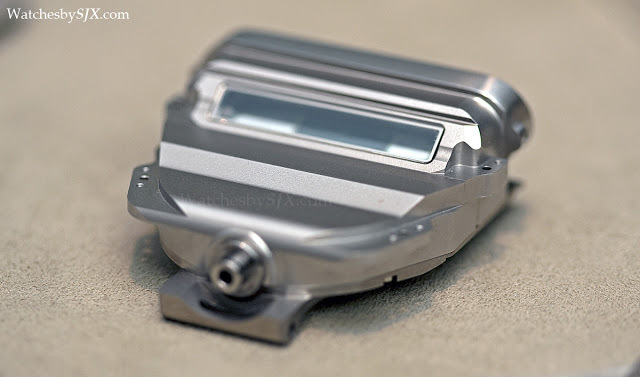 Those same louvres will also allow water into the outer zirconium case – but not the inner movement module which is sealed – so a pair of drainage vents are incorporated into the back of the case, much like exhaust pipes. 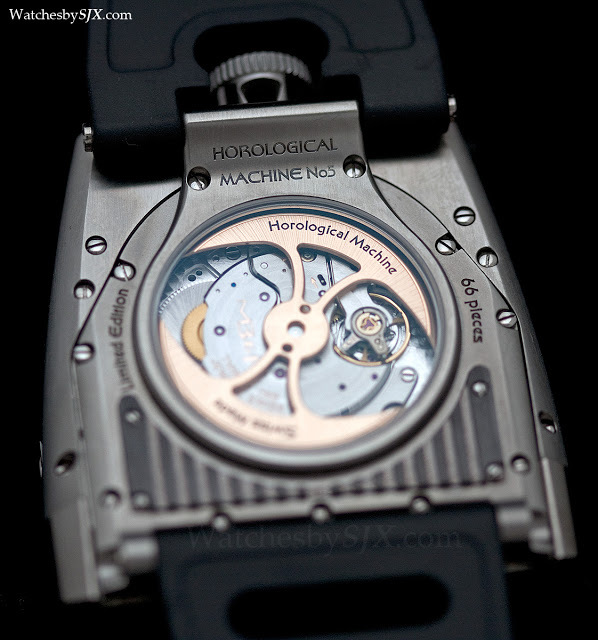 Notably, the time display of the watch is actually flat, parallel to the movement. 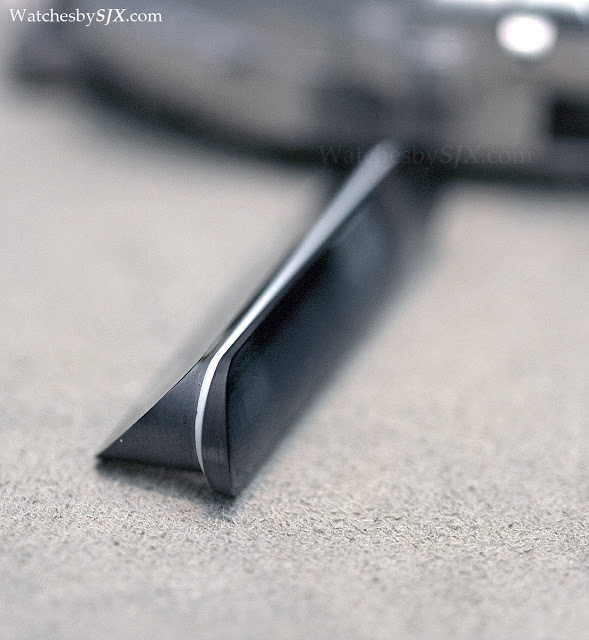 However, a wedge-shaped sapphire prism reflects the time display 90° onto the front panel of the watch. 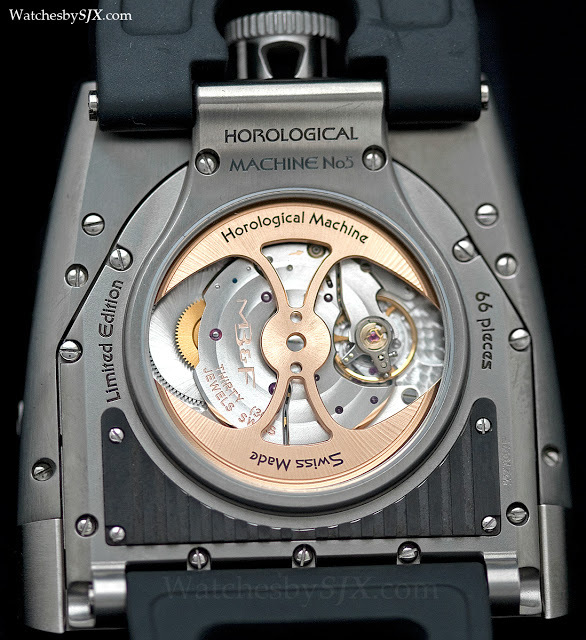 That is why the numerals – which incidentally are a sandwich construction with two mineral glass discs entirely coated in Super Luminova with masking on top – are printed in reverse. 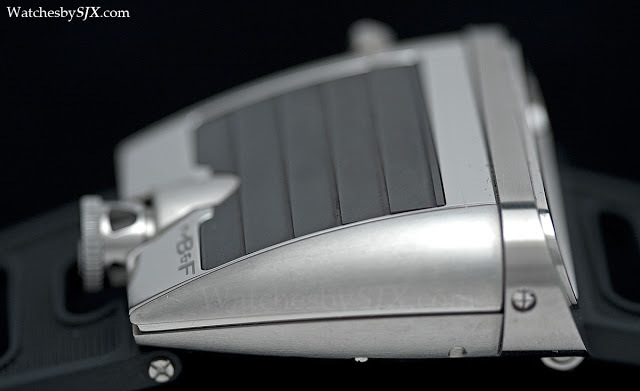 And attached to the front of the prism is a convex crystal that magnifies the numbers by 20%, improving legibility. 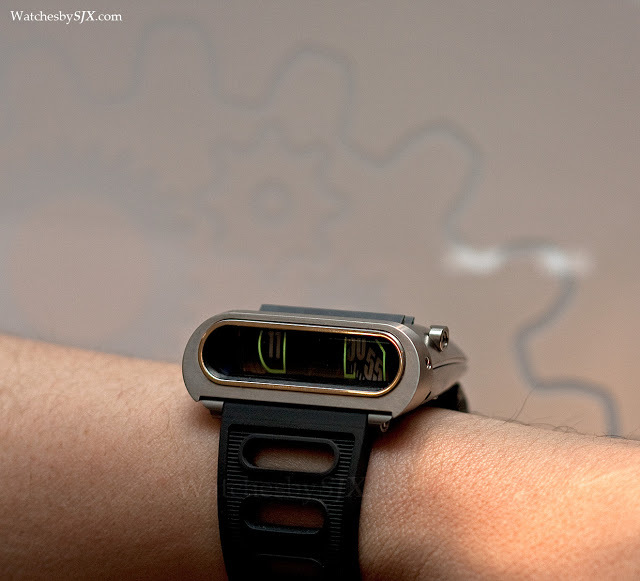 The dimensions of the watch are 51.5 mm by 49 mm, and it is 22.5mm high. 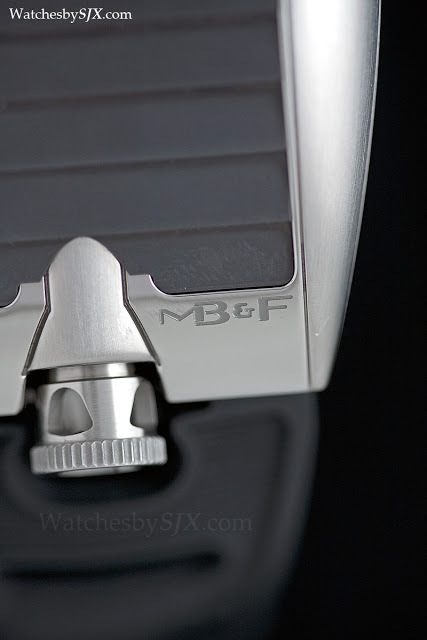 On the wrist it certainly makes a statement, like any other MB&F creation.